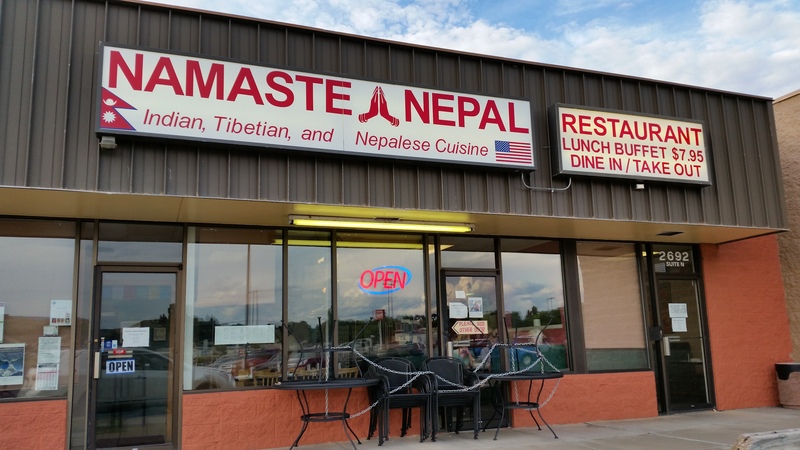 Calling all local food lovers: If you haven’t tried this place yet, you should: Namaste Nepal is a new Indian, Tibetan and Nepalese cuisine place on Orchard Mesa, in the strip mall just west of the True Value Hardware. It just opened in early spring, 2015. The food is absolutely delicious, the prep extremely quick, and the owners are extremely gracious, kind and accommodating. They have a lunch buffet, too. Some of our favorite dishes so far include the lamb boti saag (lamb cubes in a creamed spinach sauce), the shrimp pakora appetizer (shrimp dipped in a garbanzo bean flour batter and deep fried), vegetable samosas (a savory pastry stuffed with lightly spiced peas and potatoes), and the onion kulcha (Indian tandoori oven bread stuffed with onions and fresh cilantro). Namaste Nepal is super-fast for take-out, invariably having orders ready in just 5-10 minutes. Easy parking right in front, too. They recently acquired some new patio furniture so you can eat outside. It’s very quick to get there from the east or west sides of town using the Riverside Parkway. To see their menu, click here.